What makes a good work of art? Balance, composition, use of light, how the artist moves a viewer’s eye throughout the piece - any of these could strike a chord with enough people to create a general consensus of a piece’s distinction. To Harvey Oxenberg the most stirring aspect of art is its storytelling component, how art can - besides pleasing the senses - create a “leap in the imagination” by evoking a thought, memory or idea to the viewer. Capturing and conveying the essence and appeal of an artwork has become a trademark of the work of Harvey Oxenberg, who has been buying and selling art in Miami for the past four years. A New York-native, he moved to Florida in 1959 when his parents relocated for business. He worked for many years as the President/CEO of SeaSpecialties, Inc., a wholesale seafood processor and distributor in Florida, New York, and Pennsylvania. When the company was sold in 2005, the entrepreneur decided to reach out to artists he was familiar with and started representing their work. The shift in careers quickly paid off and Oxenberg Fine Art was established in 2007. Oxenberg presently signs artists such as Jack Pierson, Frank Stella, Canadian artist Jane Waterous, fine art and advertising photographer Cheryl Maeder, Brazilian painter Fernando Vignoli, and master carver Joseph Wheelwright, among others. His most recent exhibition was a solo show for Cesar Santos at the Trendy Studio in Wynwood. Oxenberg says that the social component is one of the greatest motivators in his work. With his partner Nory Contractor, he attends auctions in New York in the spring and fall and about eight art fairs a year, including Art Chicago, ArtHamptons, and Shanghai Art Fair. A member of the Wynwood Art Association and Nada (New Art Dealers Alliance), he keeps a close relationship with other art dealers, and regularly partakes in local museum activities. 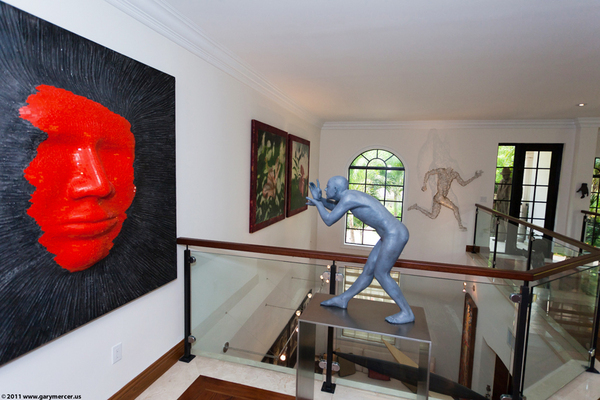 Himself a collector for more than thirty years, Oxenberg also uses his home in Coconut Grove for exhibitions and views of his private collection. What began “with two limited edition photographs by Bruce Weber of a beautiful Brazilian couple” has steadily expanded over the years, presently consisting of an assortment of seventy pieces, including large stone head carvings by Joseph Wheelwright, several photo interpretations by Vik Muniz, a mixed-media piece by Daniel Arsham, and sculptures by Javier Marin from Mexico. Oxenberg confesses that collecting art is “very addictive,” but is consistent about putting some of his own pieces for sale, as he does not believe in storing art. Idiosyncratic drawings by Elizabeth Murray, a beautiful acrylic cube piece by Teresita Fernandez, bronze sculptures by Manolo Valdez and Robert Graham, the Black Supper by Andres Serrano, a painting by R. B. Kitaj and a very well known photograph by David Drebin in a light box are also part of his eclectic collection. However, as interesting and profitable as selling is, Oxenberg says his broader intention is to help sustain artists in their profession. For the last year and a half he has served as the President of the Bakehouse Art Complex in Miami, a non-profit facility providing workspace and exhibition opportunities to more than seventy emerging and mid career artists. Lagemann moved to Miami from the Bay Area in 2008 looking to gain exposure in the Florida art fairs scene. He says his business relationship with Oxenberg has provided him an introduction into an even bigger art network. Oxenberg negotiates the complexities of business agreements, handles the day-to-day details of his career, and finds different venues for his work. Lagemann’s stainless steel pieces are priced from $5,000 - $12,000 and consistent sales have allowed him to make time to also create pieces for himself with no commercial value. Barbara Cole Lee, owner of bclee+company and art consultant for commercial and residential uses in Boston is one of the buyers who became familiar with Lagemman’s work through Oxenberg during the 2010 Art Basel Miami Beach. An art collector for over 25 years with her husband, Lee designs art spaces, purchases and installs art for large multi-use office buildings, high-end apartment complexes, corporate and executive offices, and personal residences. The three pieces she bought by Lagemann - human climbers in metal - will be incorporated into an office space to make it a more uplifting environment for employees. A business professional for many years before shifting her focus to art, Lee added “working with art, like many things, is not just about looking at pieces all day long. One needs to know about business, be technology-savvy and have good negotiation skills.” Harvey Oxenberg seems to have all of the above on his side.